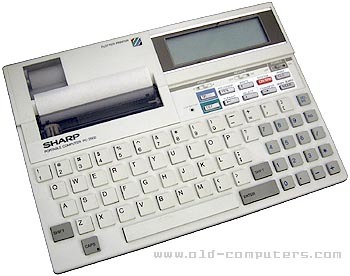 The Sharp PC 2500 has the same characteristics as the Sharp PC 1350 pocket computer. Sharp removed the small keyboard of the 1350 and added a better keyboard. The PC 2500 has also a small built in color printer-plotter (4 colors, 15 character sizes, 11,4 cm wide, 4 c/s maximum speed). The 3 KB main RAM memery could be expanded to 11 KB or 19 KB thanks to credit-card-size memory cards. The ROM contains a pretty good BASIC, a small telephone index and a small spreadsheet (10 rows x 7 columns, which can be extended to 42 rows x 20 columns with the 16 KB RAM expander). This computer had no market success. see more Sharp PC-2500 Ebay auctions !